Once again I am here to sing the praises of my clever readers! Last month I received an email from Sydney who wrote, "Love your patterns!! I'm doing the Jolly Little Christmas one now. Love the bikini one also! I was wondering if you would consider designing a mermaid block. I would like to make a baby quilt for a very special friend's new baby girl. Thank you! I look forward to hearing from you." 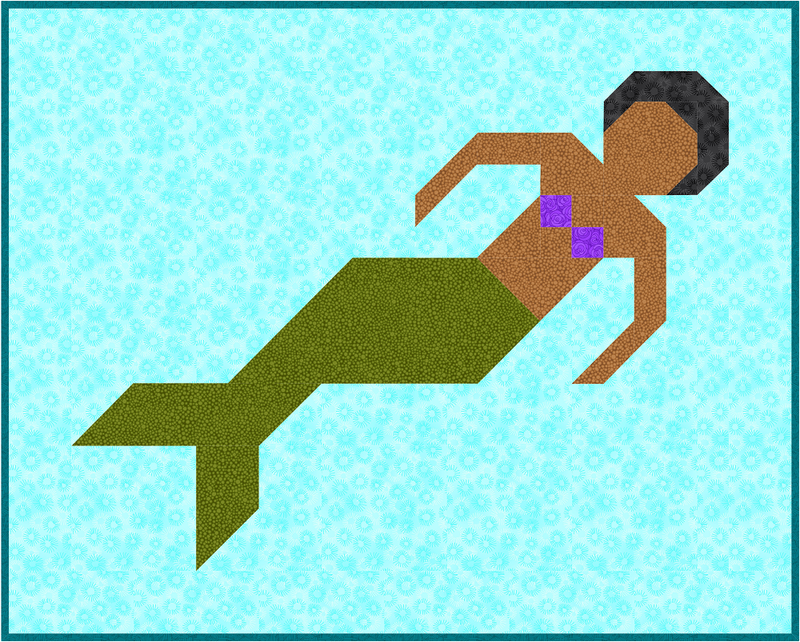 So I set to work on designing this Mermaid block and quilt pattern layout. Although I have managed to write the pattern, it's still in the testing phase. The quilt blocks finish at 18" x 21" and can easily be made with either the long or short hair versions. And the quilt finishes at 52" x 62" using 6 mermaid blocks. 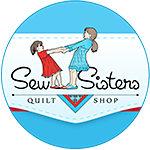 I ordered my fabric from Sew Sisters Quilt Shop. I chose Sprinkles Yellow (hair), Pink (bikini tops) and Green (tails) from the Boutique Brights collection for RJR Fabrics, Woven in Ruby (hair), Sapphire (background) and Black (hair) from the Mixology collection by Camelot Fabrics and a 108" wideback Swirly Scroll in Lime from the Essential collection from Wilmington Prints for the backing. You can purchase your Mermaid pattern here. Hope to be sharing an update on the Mermaid quilt soon! This week I received an email from Joanne who wrote, "Hi Lorna! I attended your workshop last October at the Royal City Quilters Guild in Guelph. Taaaadaaaa! It's finished! I thoroughly enjoyed piecing this quilt and my friend Linda quilted it on her longarm. Not sure if you can see the quilting but there are lots of little monkeys dancing around on the quilt. I think my grandson Arthur will enjoy it once he graduates to his "big bed" from his crib. Thanks so much for the wonderful time we all enjoyed at your workshop! P.S. I love your new finished carpet bag!" Joanne chose the Jungle Friends pattern to work on during the workshop. And it is so exciting to see her great big beautiful finish so I asked her for permission to share it with you all! Lorna, you are so creative! Another great one! Thanks for hosting! Joanne's quilt is awesome. Her grandson will love it! Also love your new quilt design - little mermaids. You are so creative. Love the fabric colors and background you chose for your blocks. So cute! Love the mermaid! Great new addition! Those mermaids are so cute Lorna....and i can't wait to see Joanne's quilt at Show and Share in September. I hope she brings it along. That mermaid is adorable! You are so talented! Another great pattern. You just keep amazing. As usual, I think you have a winner with this mermaid. SO cute! Those mermaids are fantastic! You're so clever!! Oh, I know a little granddaughter who would love the mermaid quilt! I may need to consult with her mommy. I really like that these are such big blocks--and once again, you've caught personalities and movement in a wonderful way. The animal quilt is adorable with the monkey quilting. Don't you just love it when quilters share what they've made from your patterns?! You're branching out from animals. These are super cute mergals. How about some merguys too? Is there any end to your creativity??? What an amazing block. Great job.